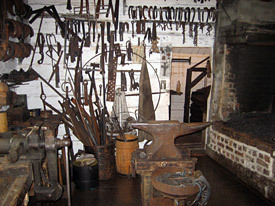 Thanks to an impressive tool collection, a visit to the Cauchon Forge and Woodworking shop will make you discover several aspects of the blacksmithing trade: how they worked the iron, the blacksmith shop itself, wagon wheel making, and the carpentry shop in their original setting dating back to the beginning of the 20th century and into the 60s. A visit to the Cauchon Forge and Woodworking shop also means discovering one of Québec's best preserved forges. Finally, it means paying tribute to the perseverance and determination of Henri Cauchon's last remaining offspring, Toussaint, to preserve this place of work, of life and of history. During your stay in Charlevoix, it's a must on your visit list! 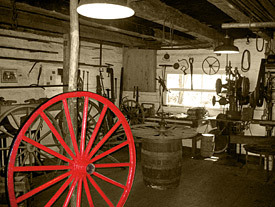 Browse through our site and discover activities offered during your visit to the Forge and Woodworking shop. Also familiarize yourself with its history, its architectural characteristics and its tool collections. This project was made possible thanks to the participation of the ministère de la Culture, des Communications et de la Condition féminine du Québec.